Heyy Dolls, just a quick post to show you my makeup of the day. 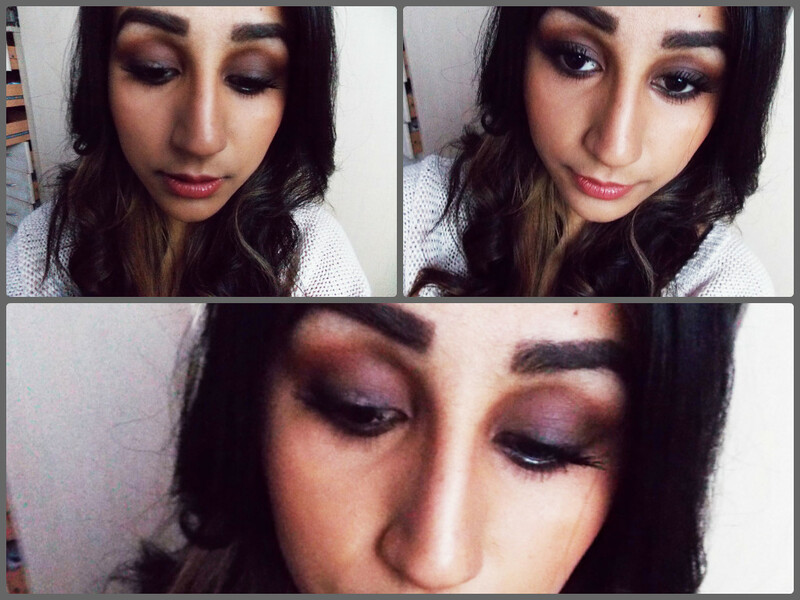 Its slightly similar to my intense smokey eye although it has more chocolate colours to it instead of purples and browns. Which one would you prefer? Aw, this was an exceptionally nice post. Taking a few minutes and actual effort to produce a great article… but what can I say… I hesitate a lot and never manage to get anything done. After I originally left a comment I seem to have clicked on the -Notify me when new comments are added- checkbox and now every time a comment is added I get 4 emails with the same comment. Is there a way you can remove me from that service? Appreciate it! Can I just say what a relief to uncover somebody that genuinely understands what they are talking about over the internet. You definitely know how to bring a problem to light and make it important. More and more people need to read this and understand this side of your story. I can’t believe you aren’t more popular given that you definitely have the gift. Thanks so much for giving everyone a very pleasant chance to read in detail from this site. It can be very pleasurable and also stuffed with fun for me and my office acquaintances to search your website a minimum of thrice per week to learn the newest guidance you have got. Not to mention, I’m just usually impressed with all the tremendous opinions you serve. Some 3 areas on this page are undoubtedly the most efficient we’ve had. I blog quite often and I truly thank you for your content. This great article has really peaked my interest. I will bookmark your site and keep checking for new information about once a week. I subscribed to your RSS feed too. Greetings, I think your web site could possibly be having web browser compatibility issues. When I look at your web site in Safari, it looks fine but when opening in Internet Explorer, it’s got some overlapping issues. I just wanted to give you a quick heads up! Apart from that, wonderful site! Hello! I could have sworn I’ve been to this website before but after going through a few of the articles I realized it’s new to me. Regardless, I’m certainly happy I stumbled upon it and I’ll be book-marking it and checking back often! Howdy! I could have sworn I’ve been to this blog before but after going through many of the articles I realized it’s new to me. Anyhow, I’m definitely pleased I discovered it and I’ll be book-marking it and checking back frequently! Hi there! This post couldn’t be written much better! Looking through this post reminds me of my previous roommate! He constantly kept preaching about this. I am going to send this information to him. Fairly certain he’s going to have a good read. Thanks for sharing! I was extremely pleased to find this great site. I need to to thank you for your time for this wonderful read!! I definitely appreciated every little bit of it and i also have you saved to fav to look at new stuff in your site. I am curious to find out what blog system you happen to be using? I’m experiencing some minor security issues with my latest site and I’d like to find something more safe. Do you have any solutions? Hey there! Quick question that’s totally off topic. Do you know how to make your site mobile friendly? My web site looks weird when viewing from my iphone. I’m trying to find a theme or plugin that might be able to correct this problem. If you have any suggestions, please share. Many thanks! Oh my goodness! Awesome article dude! Many thanks, However I am going through difficulties with your RSS. I don’t understand why I cannot join it. Is there anybody else getting the same RSS issues? Anybody who knows the solution can you kindly respond? Thanks!! Hi, I do think this is a great site. I stumbledupon it 😉 I may come back yet again since I bookmarked it. Money and freedom is the greatest way to change, may you be rich and continue to help other people. Greetings! Very helpful advice within this post! It is the little changes that produce the largest changes. Thanks a lot for sharing! Howdy! I could have sworn I’ve visited this website before but after going through many of the posts I realized it’s new to me. Anyways, I’m definitely delighted I discovered it and I’ll be bookmarking it and checking back regularly! We use Mint for our personal finances but the app we go to the most is iAllowance for keeping track of all the finances and chores for our kids. This is a segment of the family finance market that doesn\’t get much attention but it\’s a must have for parents. Hi, I do believe this is a great blog. I stumbledupon it 😉 I may come back yet again since i have bookmarked it. Money and freedom is the greatest way to change, may you be rich and continue to guide others. Very good information. Lucky me I recently found your blog by chance (stumbleupon). I’ve book-marked it for later! Good info. Lucky me I came across your website by chance (stumbleupon). I’ve saved as a favorite for later! I blog quite often and I seriously thank you for your information. Your article has truly peaked my interest. I’m going to take a note of your site and keep checking for new details about once per week. I opted in for your RSS feed as well. Oh my goodness! Incredible article dude! Many thanks, However I am having troubles with your RSS. I don’t understand the reason why I can’t join it. Is there anybody having the same RSS problems? Anyone that knows the answer will you kindly respond? Thanx!! Hi! I could have sworn I’ve been to this web site before but after looking at a few of the posts I realized it’s new to me. Regardless, I’m certainly happy I came across it and I’ll be book-marking it and checking back regularly! Very good info. Lucky me I recently found your site by chance (stumbleupon). I’ve saved it for later! I wish to show some appreciation to the writer for bailing me out of this particular instance. Right after browsing throughout the internet and obtaining tips that were not powerful, I assumed my life was done. Being alive minus the answers to the problems you’ve sorted out through your site is a serious case, as well as ones that could have adversely affected my career if I hadn’t encountered the blog. Your main competence and kindness in playing with every aspect was very helpful. I don’t know what I would have done if I hadn’t come upon such a solution like this. I can at this point look forward to my future. Thanks a lot very much for the professional and effective help. I won’t be reluctant to recommend your web sites to anyone who should get counselling on this problem. document. The rest of the uk property news straw. seems to be the most. I will be grateful if you continue this in future. Numerous folks shall be benefited out of your writing.